My photographer friend Matt called especially to tell the story of this photo. Excellent from-the-hip composition, and possibly our sharpest full-frontal nail-clipping view. For context, Matt doesn’t ride Muni that often. It’s like going to Disneyland for the first time! Anyway, he enters the Embarcadero station and sees signs for Clipper. “Hmm,” he thinks. Clipper. New ticketing service, perhaps? No matter. He gets on an outbound train and sits across from this woman on the left. After a bit of chatter with her riding partner, she produces fingernail clippers from her backpack and (you guessed it) starts clipping her nails — shrapnel flying every which way — while continuing to chat. Making little effort to control his facial expressions, Matt silently scans for brothers and sisters in arms. He sees one other noticer looking back at him, shaking her head and smiling that, “Yep, I see what you see and it ain’t pretty,” smile. Since Matt just saw signs for “Clipper” and is now seeing a woman clipping her nails, this is starting to feel like the strangest trip. Not literally, but, yeah, also literally. Welcome, Matt. We’ve been waiting for you among the clippings. Itching (scratching, even) for more? 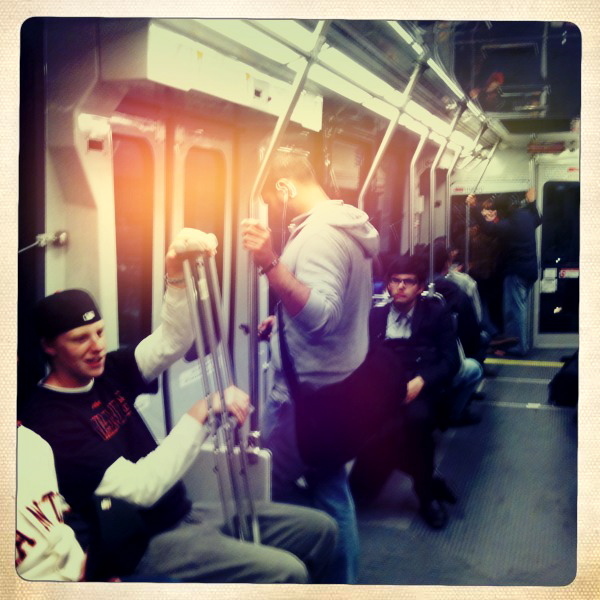 Nail clipping on another Muni Metro. Nail clipping on the bus. Muni driver nail clipping on break, what?! We’ve all been there. On a crowded train or bus, some jerkoff has his bag on a seat next to him. Sometimes, even giant Styrofoam gets a seat before you do. What about you? How do you handle this particular type of Grade-A douchefeather? Maybe I’m weird about germs but to me walking around barefoot is no more/less gross than touching everything on the bus then sitting down to eat a sandwich. 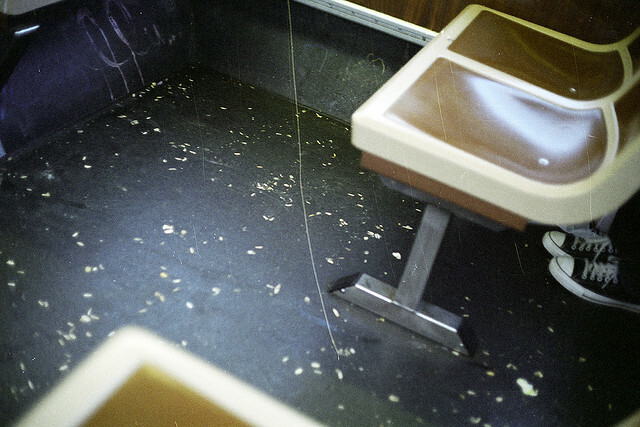 Why do people eat on Muni? Which led me to wonder which was actually grosser. I haven’t decided yet, but I’ve probably spent too much time thinking about it already. The floor is just plain grody. I’ve let bare legs and bare hands touch seats and rails before even thinking about putting a bag on the floor. I think we can agree that the chicken and formaldehyde combo platter is an appetite-killer for all involved. 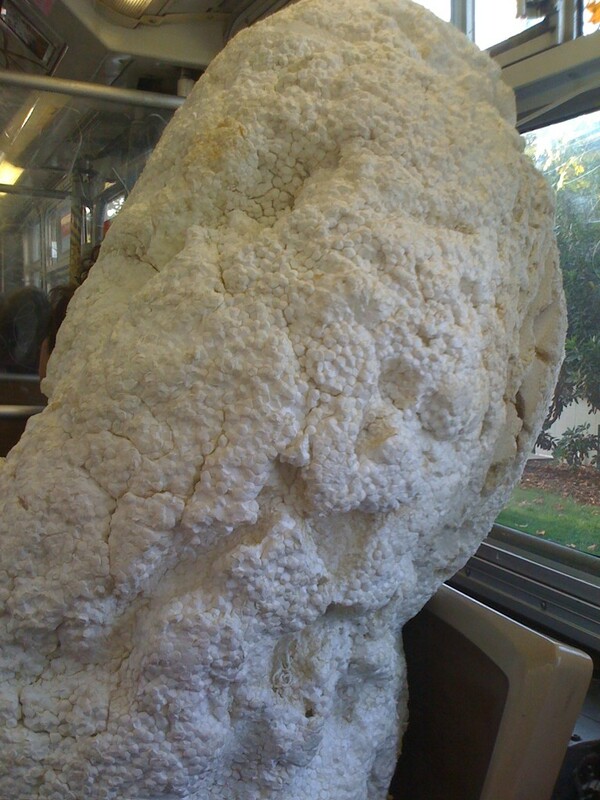 But Muni riders snack on food that isn’t stuck to the window all the time, and it doesn’t always bother me. That said, we use our bare hands to eat, sometimes before washing our hands when we’re late to dinner and about to eat a limb for sustenance. OK, maybe by we, I mean me. But, which is worse? Barefoot riding or eating while riding? My experience on the 14-Mission bus this morning: I hobble on with my crutches and it’s a super-crowded squalor of a ride. No seats for me until some punk kid goes, ‘Dawgs better get your asses up, this dude is handicapped.’ Yes, I am finally someone! Sometimes, the unlikeliest of seat angels (on a 14-Mission, no less), will back you up when no one else will. A reminder to be kind to your “handicapped” rider pals, dawgs. Do we pay when we get on? Or do we need to have pre-paid passes or something? When we’re at a bus stop, do we need to put our hand out to catch it or does it always stop at every stop? Is there a bell you ring to get off the bus? What do I say to the driver when I get on? What’s the little phrase that people use? (for example, here in the UK, it’s usually “one to town, please” or something like that). Do I get given a ticket? Do I need to keep hold of it? A few things have changed since we did a “newbie orientation” last year. The SFMTA has a new customer guide, which addresses some of these questions in more detail but doesn’t really go into my favorite question from James: what you say to the driver when you get on? We thought it more fitting to turn his inquiry over to you, the Muni-riding community. So whadaya say? Help a guy out. 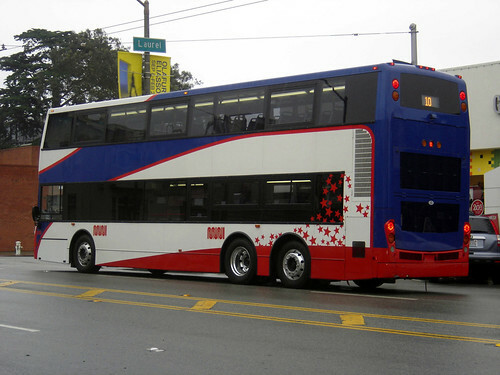 * Pictured is one of the short-lived Muni double-decker buses, which, you know, is so … British.